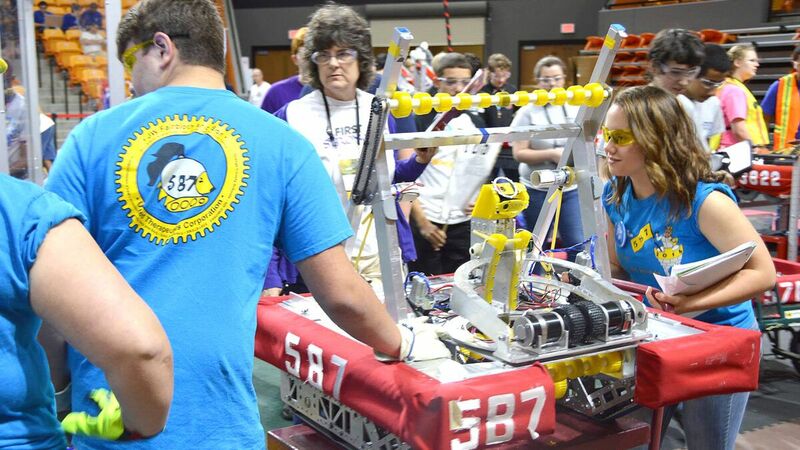 Thirty-two of the top high school robotics teams from across the state will compete in Destination: Deep Space — the championship of the highly competitive FIRST North Carolina robotics program. Both Saturday and Sunday, Campbell will host teams of students and engineering and technical mentors who will demonstrate their skill for science, mathematics and technology on the Gore Arena floor. The competing robots — built by the students in the past two months — will drive through “sandstorms,” place hatches and shoot cargo, all in the pursuit of the highest score. The top two teams on Sunday will advance to the FIRST Championship in Houston, Texas. Saturday’s competition will run from 10 a.m. to 6 p.m., and Sunday from 9:30 a.m. to 5. The event is free and open to the public. This will mark the third consecutive year Campbell has hosted a FIRST robotics event. Founded by inventor Dean Kamen — who introduced the Slingshot water purification system and the “Luke” robotic prosthetic arm — FIRST (For Inspiration and Recognition of Science and Technology) was created to inspire an appreciation of science and technology in young people, their schools and their communities. The FIRST Robotics Competition anticipates 3,650 teams in the U.S. and 26 other countries worldwide to compete in 63 Regional Events, 85 District Events and 10 District Championships. Each year, FIRST students are eligible to apply for more than $50 million in scholarships being made available by nearly 200 scholarship providers.